The magnitude of a site-specific rolled paper installation, Flow, that artist Amy Genser recently completed is outstanding, and it is located right here in northern Delaware. 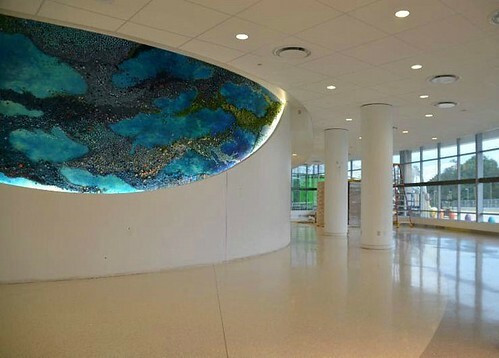 The 45 x 10 foot mural - the largest piece Amy has created to date - hangs in a brand new wing of the Nemours/Alfred I. duPont Hospital for Children. Undoubtedly, stressed families will be drawn to the soothing cool colors, graceful curve, and textured surface. A bonus is that Flow can be seen from outside the building... the colors coordinate perfectly with its exterior. 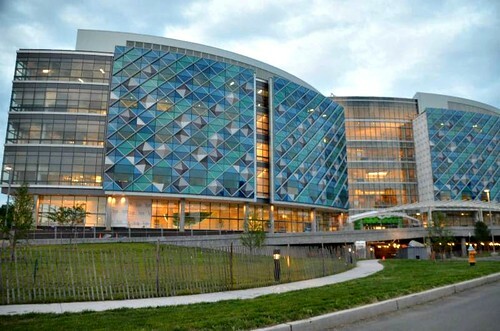 I'm looking forward to visiting in person - the expansion will officially open in October, but on Saturday, September 20, the public is invited to tour it during Nemours Community Day. 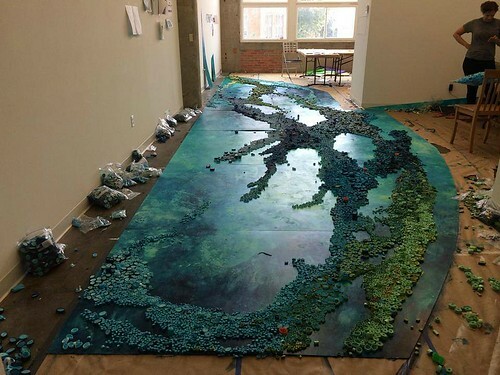 Amy and a group of assistants assembled Flow in four sections, working in her Hartford, Connecticut studio - you can imagine the number of hours spent at floor level! She transported the sections to the hospital, supervised the week-long installation, and lastly filled in additional coils where needed. In case you missed my earlier post about Amy, you might like to read this description of her creative process. I usually work with Thai Unryu [mulberry paper] but I have hundreds of papers in my studio from all around the world. I treat the paper almost as a pigment, layering colors one on top of the other to create different colors. My pieces are about a foot wide. Then I roll one layer on top of the other in all different thicknesses. I seal the roll with acid-free, archival glue stick, and then cut the long piece into sections with scissors or pruning shears. I have pruning shears of all different sizes to accommodate different widths. The rolling and cutting process is actually pretty quick. At this point I could pretty much do it in my sleep. It's the composition/editing process that usually takes the longest. 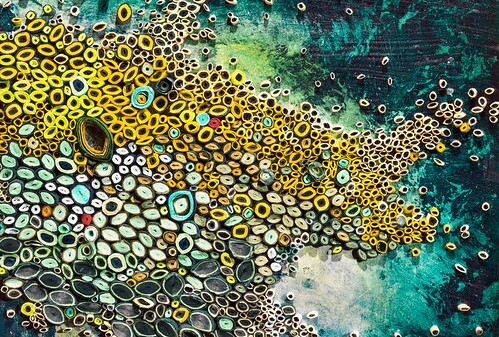 I paint my surface, either canvas or paper first, with acrylic and a lot of gel medium. Then I place my paper pieces on top and manipulate them until I have a satisfactory composition. It's like putting a puzzle together, only I don't know the final picture until I see it. I roll my pieces accordingly as I develop and build the piece. It's a back-and-forth process. The paper and the piece lay on different tables in my studio. I attach the paper onto the canvas with PVA once I have the pieces where I want them. Above is a close-up of Amy's typical coils as seen on her new website. 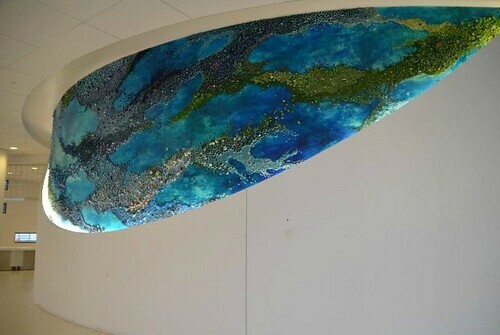 She is also on Facebook where you can view more photos of Flow's construction and installation. Fantastic! It's like your viewing earth from outer space. Truly amazing!! 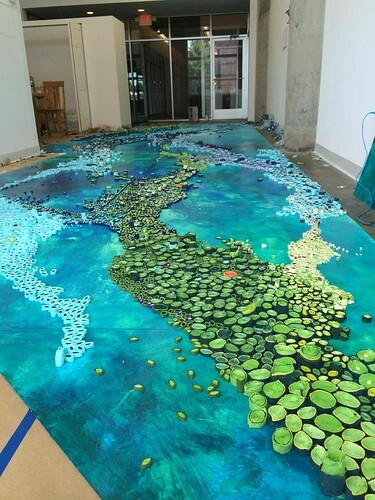 To create such a huge piece and get so many colours and shapes to work together is a great achievement.